Warren Spector says he "desperately" wants to bring the original Epic Mickey to the Xbox 360 and PlayStation 3. 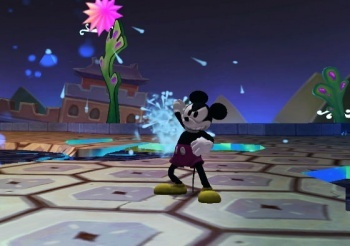 Epic Mickey originally began life as a cross-platform game for the Xbox 360, PlayStation 3 and PC before discussions about the nature of a Wii port turned into a decision to make the game a Wii exclusive. But designer Warren Spector hasn't given up on the idea, and in fact seems quite eager to get it done. "I will tell you I desperately want to do it, and other than that I have no comment at this time," he told Game Informer when asked about his interest in bringing the game to other platforms. "I just think it would be cool for people to see where the story started, so we'll see." Even though Epic Mickey has been out since late 2010, the idea of porting it to other platforms now isn't entirely without merit. The recently-announced sequel, Epic Mickey 2: The Power of Two, is being developed for the Xbox 360 and PlayStation 3 as well as the Wii, and what better way to entice 360 and PS3 owners to try the new game than by giving them a proper crack at the old one? And while Epic Mickey was far from a train wreck, I have to think that it would have performed significantly better as a multi-platform release. Spector's "no comment" isn't particularly informative but if Epic Mickey is being planned for other platforms, it's likely to happen soon: Epic Mickey 2 is slated to come out this fall.